Today's buyer fields an average of three hundred digital messages every single day. In just seconds, recipients decide whether to answer or ignore your outreach online. With digital communication now a requisite to earning those critical in-person interactions, how can you attract attention, increase influence, and sell smarter in the modern marketplace? Welcome to the art of Digital Persuasion. Erin Gargan's sales messaging formula has been leveraged by some of the world's biggest brands to open more opportunities, ignite profitable relationships, and inspire action from behind the screen. Erin Gargan King knows how challenging it is for sales, marketing and event professionals to attract attention and communicate persuasively in today's congested online world. Erin sold her first two companies, Jump Digital Media and PMS.com (featured in Forbes) before the age of 30. In 2010, she launched Socialite Agency, an award-winning social media marketing firm. Erin has been hired by The Oscars, ABC-Disney Television, Nelson Mandela's Legacy of Hope, VISA, Hitachi, Siemens, Abbott Laboratories, Synchrony Financial, National Association of Broadcasters, The United States Navy and others. She's helped these global brands leverage digital persuasion techniques to attract attention, increase influence and sell smarter in the modern marketplace. Frequently invited back for consecutive annual events, Erin is known in the conference world for one thing in particular: her energy! Her talks deliver a powerful, specific, actionable formula that's spiced with stories, data and a lot of fun. Audiences leave inspired, motivated and highly entertained. Erin lives in Laguna Beach, California with her husband. When she is not traveling the globe speaking, Erin can usually be found surfing, snowboarding, mountain biking or catching up with friends and family over a sunset glass of grapes. What inspires us to take action? What do the most digitally persuasive posts, messages, and emails have in common? How can direct sellers and marketers persuade today's social, mobile and digitally overwhelmed consumer to stop the scroll and engage or better yet, share? Social and digital platforms can be the modern marketer's best friend or worst time-wasting enemy. 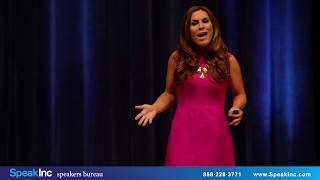 Using her experience having sold two companies before the age of 30, and having quarterbacked hundreds of social media campaigns for VISA, The Oscars, ABC/Disney, Target, Hitachi, Siemens and others- Erin shares her very simple secret for communicating in a more persuasive way every single time you type, text or tweet. You'll quickly and easily understand how to combat our tendency to deploy generic digital messaging. You'll understand what is scientifically happening with social posts that get ignored versus the ones that ignite action and gain momentum. You'll see your stories, emails, texts, videos and all other digital communication get a much needed persuasive punch- so you can positively influence others to get on board with your mission. Translating what makes us so persuasive face to face to work more effectively in the digital environment starts with examining our daily customer communications through a new lens. Increase your digital persuasion prowess, and you'll quickly increase the tangible success of your digital sales and marketing efforts. You'll leave empowered, enlightened and of course- entertained! When you type, text or tweet, how persuasive are you? When you reach out to someone you don't know online- what can you say to persuade them to give you a chance? Your ability to positively influence others -without the power of face to face communicaton- is THE business skill to master to work smarter in today's modern marketplace. Forget firm handshakes and eye contact- first impressions in the 21st century are dependent on your digital persuasion prowess. Are you able to earn a new opportunity- using just your keyboard? In person, you have 8 seconds before someone decides how they feel about you using your nonverbal persuasion skills: your appearance, your eye contact, your smile. Online, you have just 2.5 seconds- and none of those personally persuasive elements. How can you win over that potential customer, client or partner and inspire them to take your desired action? It starts with persuading your recipient that your message is worth stopping the scroll of that mobile phone-in just a few words. Erin helps her audiences understand the psychology behind why some people's digital messaging wins face time with new prospects-while most others don't. She shares her formula for how to effectively and appropriately elicit a response, spark a dialogue and break through the "empathy blockers" AKA screens to elicit greater emotion from potential buyers. Using Erin's specific formula, attendees leave empowered and equipped to attract attention, increase influence and sell smarter in the digital age. As a professional speaker or event planner- is social media your best friend or your worst enemy? Are you using it to drive attendance, attract attention and amplify your message? Or maybe you've tried a few tactics here and there, didn't see results, got frustrated and gave up. Social media can be the most powerful tool for putting a digital microphone and a spotlight around you, your message and your event. When harnessed appropriately, social media can activate friends telling friends, digital endorsements and drum up buzz and excitement like no other channel. They key to success is knowing how to use social media before, during and ESPECIALLY AFTER your events to drive leads, conversions, sign-ups, awareness, attendance and business from your most targeted prospects. Erin shares her pre, during, and post-event checklist for social media success based on her experience running social media communications for hundreds of industry events over the last decade. She'll showcase real client stories, results and best practices that you can take and implement into your own social marketing efforts. You'll understand why some social media efforts pay off, while others are a waste of time. Using Erin's formula, you'll leave empowered and equipped to attract attention, increase influence and win more opportunities-using the power of social media.